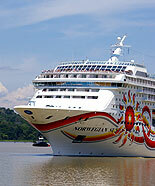 The MS Saga Ruby is a cruise ship owned and operated by Saga Cruises. 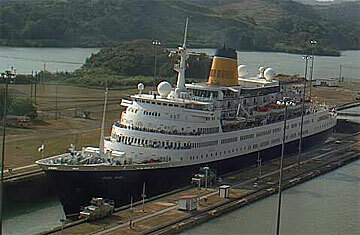 She was built as the combined ocean liner/cruise ship MS Vistafjord in 1973 by Swan Hunter Shipbuilders in the United Kingdom for the Norwegian America Line. 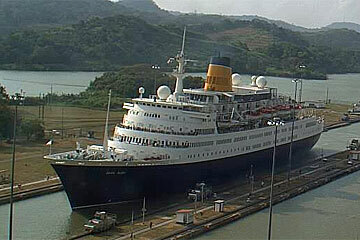 In 1983 she was sold to Cunard Line, retaining her original name until 1999 when she was renamed MS Caronia. In 2004 she was sold to her current owners. 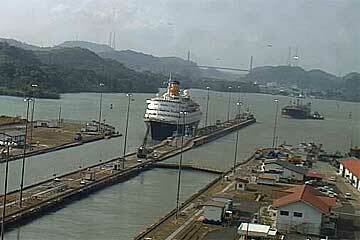 The MS Saga Ruby is shown here in the attached images on her South Bound Panama Canal transit on January 14th 2010. Saga Ruby’s furnishings give the ship an elegant yet contemporary feel. Her well-appointed public rooms and bars allow you to mingle with other passengers and relax whilst enjoying the varied entertainment available.